We've known for awhile that Azrael is coming to Gotham. The warrior of vengeance for the Order of St. Dumas, Azrael is a title passed down in the order, representing all their triumphs and combatting all their failures. Well, there's one pretty significant failure we saw in the first half of Gotham season two, when the Order's plans to take over Gotham City and destroy the Wayne family were foiled. "They don't just go away. They stick around!" executive producer John Stephens told ComicBook.com in an interview with a laugh. "They're very stubborn." With a subtitle for the second half of the season like "Wrath of the Villains" and a clear need for vengeance, yes, he confirmed, we'll see Azrael in the second half of the season. But just how much will comic book fans recognize the character? Quite a bit, Stephens teased. "In many respects, Azrael will have many of the hallmarks and traits that we know from the comics," he said. "But it will have a brand-new twist upon that character; the way we're going to bring that character into being on our show will be different than anything we've seen in the comics." Despite that teased twist on his origin, Stephens promised, "it will be identifiable as Azrael in all respects, just a version of him we've not seen before, which is the point of doing these! How can we do the character with a fresh twist?" There's one extremely recognizable part of Azrael that Stephens, usually fairly open in our conversations, uncharacteristically clammed up about. I asked if we'd be seeing his signature flaming sword. After a hearty laugh, Stephens said simply, "That, I have to say, wait and see." He did concede, though, "you had to at least ask." 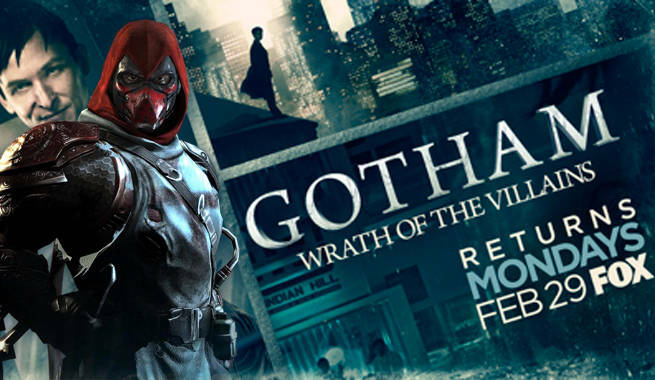 Gotham season two: "Wrath of the Villains" returns to FOX at 8pm Monday, February 29, 2016.